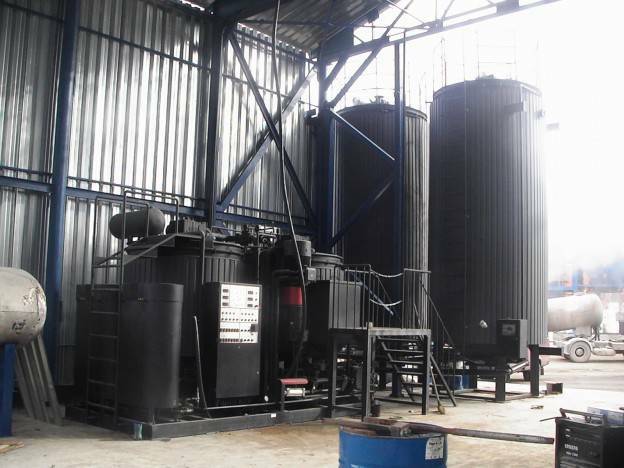 Benefits of Polymer Modified Bitumen Plants - GlobeCore Bitumen Emulsion. Polymer modified bitumen is used for road construction The intensity of freight traffic is rapidly growing every year. Proportionally increases the load on pavements. These conditions lead to irreversible deformations, degradation, brittleness, cracking and aging of roadways. In this situation, a method has been developed to improve thermal characteristics, fragility and tendency to aging – by adding special substances into bitumen. They are called modifiers, and bitumen obtained in this method – modified. The modifiers applied are synthetic polymeric materials. Introducing polymers creates a complex colloidal structure of bitumen, changing its rheological characteristics: temperature sensitivity, adhesion properties, elastic and strength characteristics. As well as decreasing deformation under load, and restoring elasticity. A polymer-modifier added to bitumen absorbs the low molecular weight fraction of the bitumen, reducing its volatility and increasing its strength. For technical realisation of modified bitumen GlobeCore developed an installation UVB-2. Polymer modified asphalt plant includes: two reactors, colloid mill, an oil heater (used to heat the bitumen without damages), bitumen supply pump, polymer feed pump, bitumen valves, control cabinet, technological heating system, an input node of adhesive additive, plasticizer, and polymer loading platform. Mounted inside the heated colloid mill there are movable and stationary discs, that allow to adjust the gap. The control system works the equipment, in both manual and automatic mode. Start up of the equipment at future operation site (if necessary).